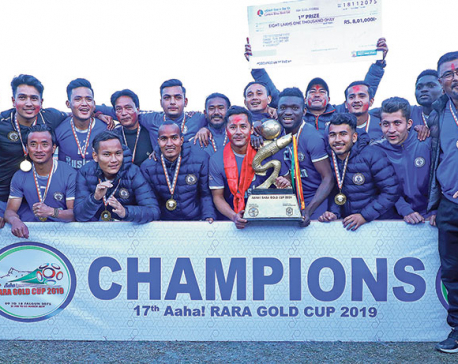 ITAHARI, Feb 3: The departmental team Tribhuvan Army Club has lifted the second Madan Bhandari Memorial International Invitational Gold Cup Football Tournament with a surprising 2-0 win over the A-Division League champion Manang Marshyangdi Club in Itahari on Saturday. 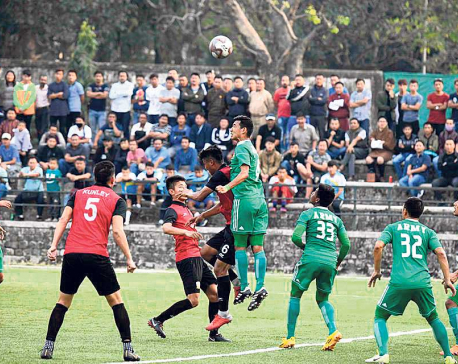 At the Itahari Stadium, Army kept Manang under pressure throughout the game and the first division winner could not play as expected. 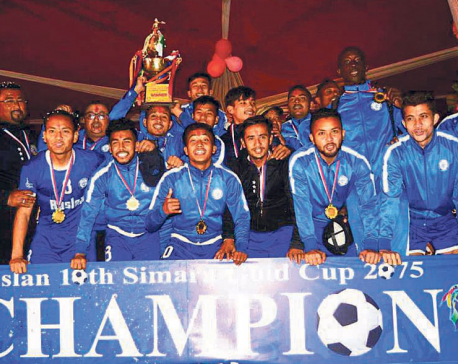 Tanka Basnet and captain Bharat Khawas helped the departmental team win the title. Manang’s midfield and forward players could not play well like they did in the quarterfinal and the semifinal matches. Army took advantage of that and absorbed Manang’s midfield and isolated its front line to dominate throughout the match. Army took the lead through Basnet in the sixth minute of the match as he scored a wonderful goal from outside the box initially resulting from a corner. Army was ahead 1-0 at the end of the first half. In a tense encounter between the two heavyweights in Nepali football, seven players were given yellow cards. Manang’s Afeez Olawale became the only player in the tournament to see a red. He was given the marching order after he fouled Army keeper Bikesh Kuthu inside the box in the 25th minute. Captain Khawas sealed the game with a goal in the last minute of the injury time as he finished a one-vs-one chance. With the win, Army took home a cash prize of Rs 1.6 million. Runner-up Manang was rewarded with Rs 800,000. Army’s Bimal Pandey became man of the match in the final and bagged a purse of Rs 10,000. Army’s Basnet was named the man of the tournament and was rewarded with a 42-inch TV and a cash prize of Rs 25,000. Highest goal-scorer of the tournament, Khawas, received Rs 25,000. 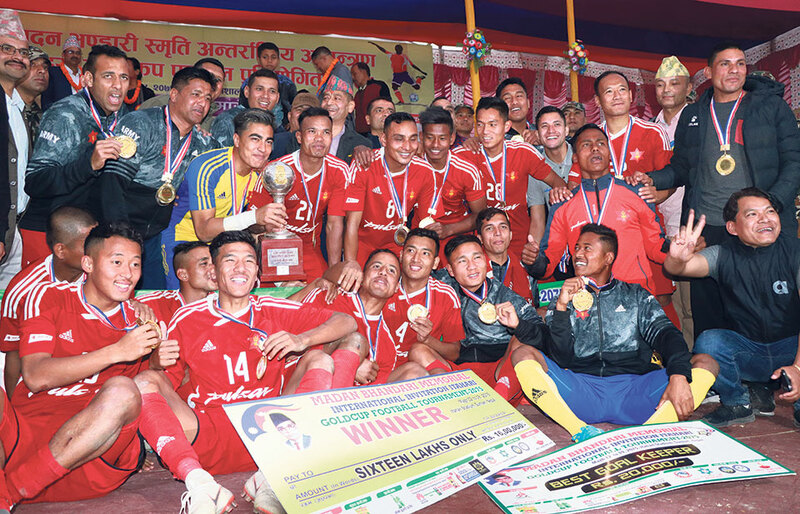 Army’s Bikesh Kuthu, Santosh Tamang, Khawas and Chum Bahadur Thapa were named the best goalkeeper, the best midfielder, the best forward and the best coach of the tournament respectively. Suraj Bishwokarma of Manang was adjudged the best defender. They all got Rs 20,000. The host Rastriya Jagriti Club’s Umesh Rai, who was named the rising talent, got a 24-inch TV.